Fresh, cool, clean. Just like a glass of gin and tonic on a clammy, humid day, Agua de Mar makes a refreshing addition to the eating and drinking scene in Cartagena. 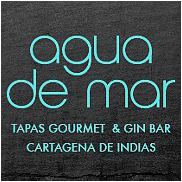 Passionate owner Mar (Spanish) arrived to Cartagena with the intention of creating a tapas and gin bar of the highest calibre. This she has achieved with a commitment to utilising the best ingredients from around the world, nourishing local talent (such asup-and-coming mixologists) and forever innovating. Located in the heart of the walled city, just moments from the animated Plaza Fernandez de Madrid, Agua de Mar is a cooling oasis filled with glass and water and whites. These clean aesthetics make the perfect antidote to Cartagena's often oppressive heat and compliment the fresh food and drink on offer. First things first: the bar. Boasting every variety of Gin and Tonic Water currently available in Colombia, together with a selection of more than 90 different South American and European wines and champagnes, it's certainly well-stocked. Add to this the previously mentioned flair of mixologist, Camila (recently named one of 8 Colombian finalists in the World Class 2015 Bar Competition) and Sebastian and you've got a bar definitely worth visiting. When it comes to the tapas, Agua de Mar operates under the mantra of less is more. The menu offers Spanish-inspired cuisine fused with the best of Japanese, Thai, Indian and Lebanese flavours.. all delivered in small easy-to-digest portions. There may be a few grumbles from those seeking quantity not quality in their dining choices.. but that´s mostly probably due to the fact that everything is so tasty.. it´s impossible to get enough! Given that the standard Colombia lunch contains an average of 2000 calories (hello bandeja paisa and mojarra frita with coconut rice, we're looking at you), you'll most likely be ready for something a little more on the light side come dinner time. And well, it's tapas.. it's not meant to be huge, right? Overall, Agua del Mar is the place to come when you are in search of quality. The prices are on the upper side of what's available in Cartagena, which means the clientele tend to be a little more exclusive and demanding of a higher standard. Step over the watered walkway into the oasis of cool, order a Gin and Tonic and enjoy.. bliss.